The Pacers under Frank Vogel have been one of the NBA’s least adaptable teams. They always play two big men together, and almost always in a traditional center–power forward alignment; David West and Luis Scola played just 84 minutes together all season, per NBA.com. Vogel has allowed for almost no positional flexibility. The rotation has been set in stone, altered only after the Pacers shocked the NBA and their own players by swapping Danny Granger for Evan Turner at the buzzer of the trade deadline. Turner has mostly been a disaster, and Adrian Wojnarowski of Yahoo reported late Tuesday that Turner and Lance Stephenson got into a fistfight right before the playoffs. Stephenson is terrifying — in my top 10 of NBA players I’d least want to fight, up there with Tony Allen, West, Gerald Wallace, and other surly types. It’s no secret that Stephenson can frustrate teammates and coaches. He over-dribbles, pursues flashy highlights at the expense of simpler plays, and is always stealing rebounds from his teammates — something that has been an internal irritant this season. But he can be a devastatingly effective player, and he brings a dose of speed and athleticism off the bounce Indiana really needs. The team’s starting five has logged more time together over the last two seasons combined than any other five-man unit, and before the Turner deal, Vogel rolled out the same bench-heavy lineup at the start of every second and fourth quarter. They have even defended the pick-and-roll the same basic way for years. There have been tweaks here and there. Vogel turned over more ballhandling duties this season to Stephenson, essentially morphing C.J. Watson into a shooting guard. West drops back more on the pick-and-roll these days, especially when stretchier centers space Roy Hibbert far along the baseline. But they’ve been relatively inflexible, and that stubbornness worked for them. It gave them an identity: smashmouth basketball. They’re the no. 1 seed, with the league’s best defense. Their style clearly works against Miami, the team the Pacers are designed to beat. Some teams build rosters to play any style — to react to the tactics of any opponent — or engineer makeovers that make opponents uncomfortable. The Pacers are not that kind of team, and that has been fine for them. But the Pacers’ offense, always teetering on the brink, collapsed in early February, and the team ran into a first-round opponent well equipped to deal with Indiana’s preferred style of defense. The Hawks spread the floor with 3-point shooting, and they have rained jumpers from all over the court as Indy’s big men hang back in their usual spots to protect the paint. Atlanta came in to Tuesday 3-0 against the Pacers with Pero Antic available, including two blowouts in Indiana. It was tempting to suggest ahead of Game 2 that Indy’s big men should step out farther, perhaps even trapping ball handlers on the pick-and-roll. But none of Indy’s four rotation bigs are quick enough to manage that, though West and Ian Mahinmi can fake it. And so the Pacers did something that was probably painful: They started switching. And the Pacers didn’t always execute the switch well. 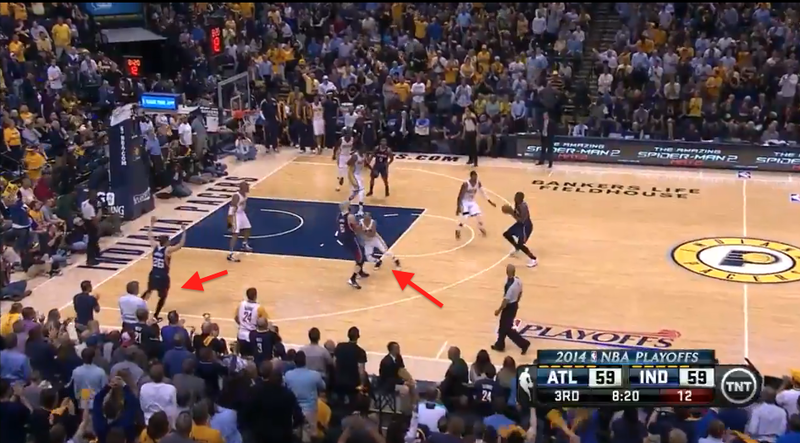 Sometimes they didn’t do it at all, yielding the same open 3s that have killed them all season against Atlanta. It was fun watching a group of experts fumble around learning a new thing. You could see Teague thinking on some of these plays, working out the math. It’s generally a bad thing if players are showing their work on the court. It’s evidence of uncertainty, of a gummy process, and the Pacers are willing to live with anxious midrange jumpers. This was only one game. The Hawks are still a problem, they’re going home to a place where Indiana has struggled in recent years, and Mike Budenholzer will adjust. Atlanta will be ready to attack those switches — to get into their offense faster, force the Pacers to contort earlier in the shot clock, and find the juiciest option that emerges. Millsap will be prepared to torture smaller players in the post. The Hawks tinkered with abandoning the pick-and-roll altogether on some possessions, short-circuiting Indiana’s planned adjustments and just letting Millsap attack Hibbert off the dribble. They’ll tilt more of their offense to Kyle Korver, lost in the shuffle a bit on Tuesday. But the Pacers scrapped, and their effort on defense carried over to the other end, where they shot 53 percent and lit up the Hawks for 113.6 points per 100 possessions in Game 2. That is a revelation for a team that has looked borderline incompetent with the ball for two months. Indiana was just zippier on offense. Hibbert and West fought harder for post-up position, with poor Roy even darting hard from one side of the block to the other as the Pacers swung the ball. He still can’t make anything, or even keep his balance against the wily Antic, but at least he’s playing with some verve. This is how the Pacers have to play offense to have any hope of winning multiple series, and all this good stuff might not have even been relevant had Scola not rediscovered his midrange jumper when Indy was still flailing around early. Watson has been helpful all season, and Vogel found something in Game 2 by pairing Watson with Hill. The two played just 102 minutes together all season; Watson played more with basically every member of the Pacers’ rotation, including Orlando Johnson, who hasn’t even been on the team since February. That’s adaptation. Little-guy lineups can work against Atlanta, which is a small team on the wing with zero post-up threats there. The Heat are a different story, with LeBron James and Dwyane Wade capable of bullying on the block. That’s the team Indiana is built to face. It has to get there first, and Game 2 was one of just three or four games the Pacers have played since February 1 that made you believe we might really get Heat-Pacers in late May.